Are you a youth (age 16 – 27) interested in the arts and taking your talent to the next level? Well this is the program for you! We have started recruitment for youth interested in the arts to join the 2018 edition of the Ada Slaight Youth Arts Mentorship Program. If you are interested or know someone who is, please get in touch with Tomas Kanene (Tkanene@artscape.ca) or visit the Artscape office on the 2nd floor of Daniels Spectrum (585 Dundas St. East). Deadline to sign up is Tuesday, November 7th. Get a sense of the energy and benefits of this program; check out our latest wrap-up video below! Twelve youths will be selected for the program, which runs from January to May 2018. 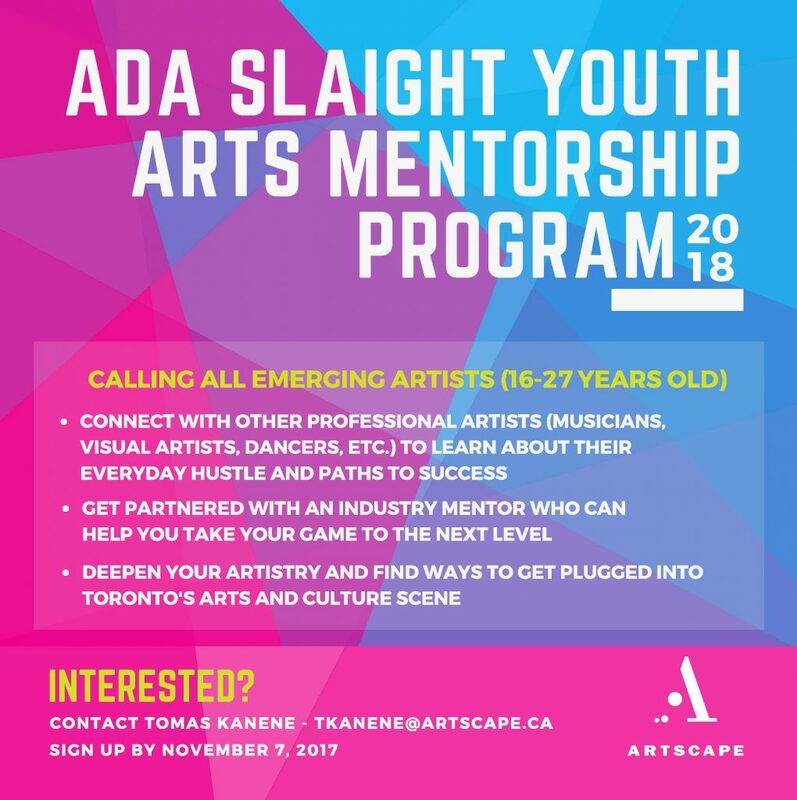 This workshop series is a component of the Ada Slaight Youth Arts Mentorship Program, which provides youth access to arts & cultural experiences, educational workshops and opportunities to explore a career in the arts. Artscape gratefully acknowledges the generous support of the Slaight Family Foundation that makes this program possible.